Railway modelling UK, Australia, Ireland and Canada or model railroading US and Canada is a hobby in which rail transport systems are modelled at a reduced scale. 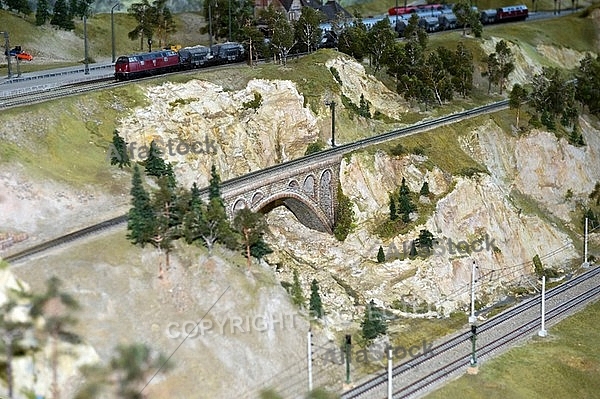 The scale models include locomotives, rolling stock, streetcars, tracks, signalling, and roads, buildings, vehicles, model figures, lights, and features such as streams, hills and canyons. The earliest model railways were the 'carpet railways' in the 1840s. Electric trains appeared around the turn of the 20th century. But these were crude likenesses. Model trains today are more realistic. Today modellers create model railway railroad layouts, often recreating real locations and periods in history.